"Is the "T" loose, or does it have any play" - If it is loose, it could mean that one of the ears on the stick is broken, and the "T" is only being held on by one or neither of the ears. The "T" should not move and be tight on the stick. Some sellers will be selling a complete shifter with the "T" off and the ears broken and will say; "Needs Work" - Yea, it needs to be fixed, it needs a good stick. Stay away from these. Most likely it is just like the one you already have. Some sellers will swear that it is in "perfect working condition", just missing the "T" handle. Wrong! The mounting ears are gone and the "T" handle is long since been thrown away. Yes, you can push down on the roller and the shifter will move, but it will not take a "T" handle. When you do find a good, complete shifter for sale, most likely the seller knows what he or she has and it will be pricey. I've seen good shifters go for over $300 routinely. I saw one go for $575 once with some heavy bidding. They are usually complete shifters with neutral safety switches and the floor boot, but still, that's high. 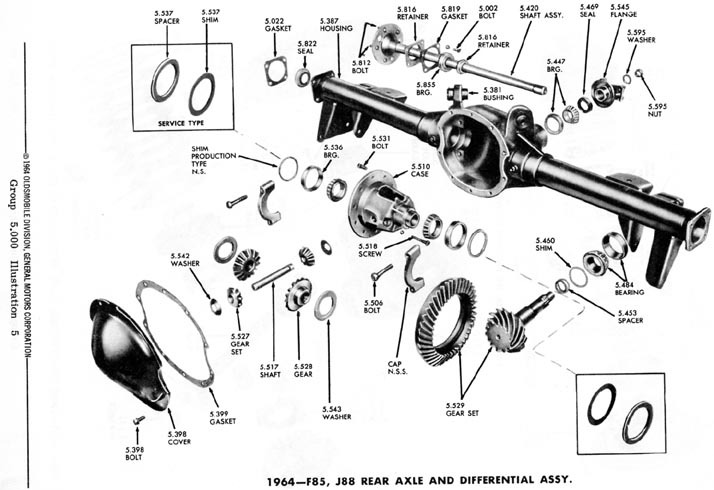 Having a 3-speed manual 442 now, I've researched them quite a bit. The Lansing body code for the hole in the floor for the 4-speed is L, of course, but the code for the 3-speed manual is "B". On the passenger side of the main case is a number stamped "Verticaly" beginning with a "P" and ending in a letter "A, B, or C"
C = M-22 Refered to as the "Rock Crusher"
The main difference between the Wide & Close Ratio is noticed between 3rd and 4th. The Jet-A-Way was the Oldsmobile name for the GM Super Turbine 300. They are completely different from the Powerglide. The Jet-A-Way was the only automatic available for the 65 & 66 4-4-2's. A "Special Duty" Jet-A-Way was used in the 4-4-2. 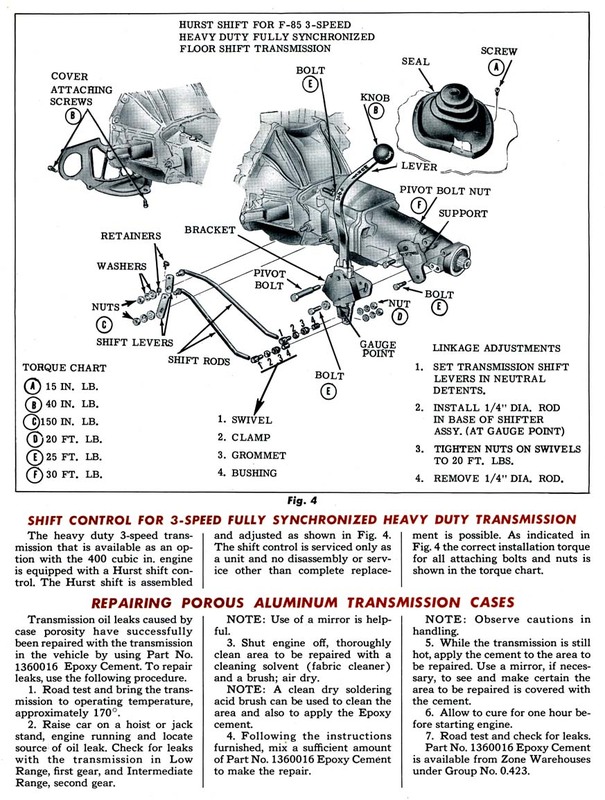 It featured additional forward and reverse clutches, a recalibrated valve body for a more positive (harder) shift and other performance improvements. NOTE: Some very early 65,s use a TH400 style metal tag with Jet-A-Way codes. The code is either stamped on a metal tag or on the lower servo cover. It identifies the year, model, date built and plant shift. I've done a great deal of research on these handles, and I have seen many come and go. I know they run from 64 thru 66, but I believe that they were installed in 67's as well. Here is some advice. First of all, these things break like a twig. 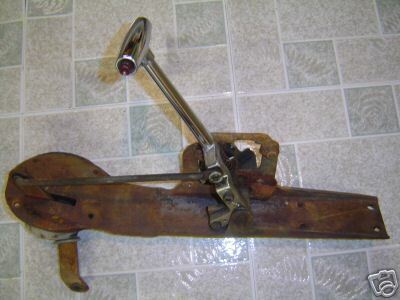 Many owners bought their car with a broken shifter and have never seen one that was NOT broken. 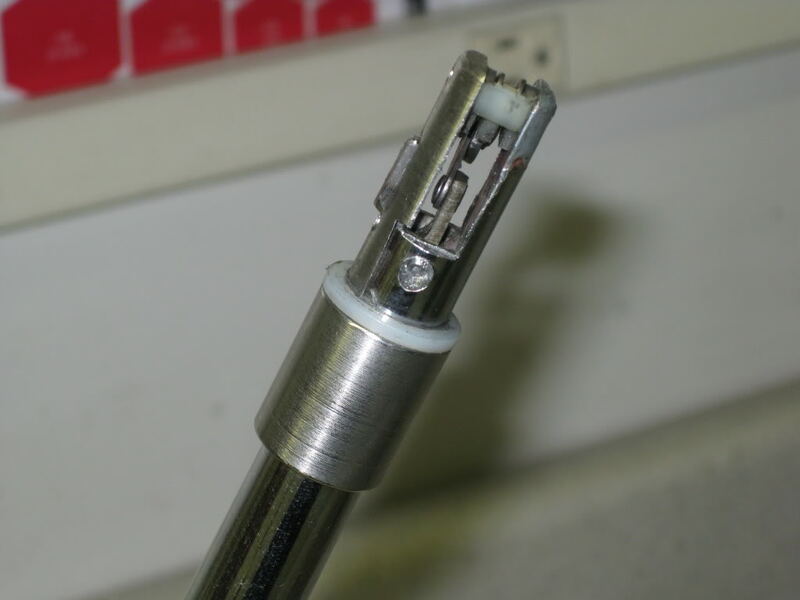 Most people think the "T" part is what broke, and that's why they have just a stick with a small roller on top to push down on to release the detent. Not correct. The "ears" on the stick are what have broken so the "T" simply has nothing to connect to. These grommets can be found at http://www.supermuscleparts.com/ under Nova shifter parts. You can get rid of that sloppy Saginaw and install a new Hurst Competition Plus Shifter and still keep the original shifter handle. 1. Get the new shifter and linkages for the 65 442. 2. Remove the Hurst handle from the gate. 4. Bolt your 442 shifter to the adapter. That's it! 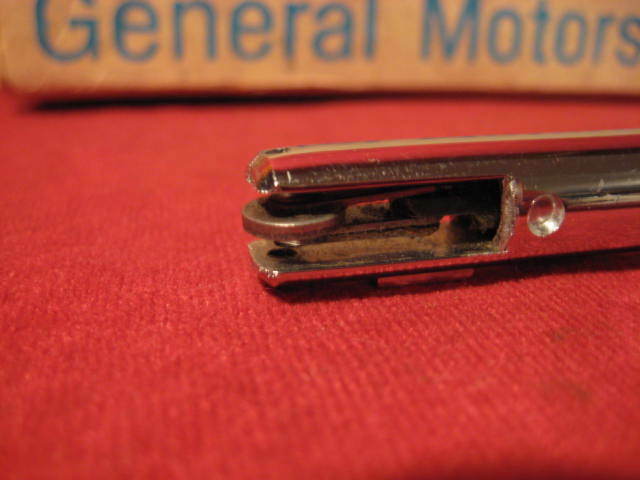 From 1964-67, GM A-body rearend housing dimensions measure 56.5 inches, from flange to flange. Total measurements with the drums in place is 60.5 inches. The dimensions are similar to the 1967-69 Camaro / Firebird, and 1968-74 X-cars and clones, except leaf springs were used. 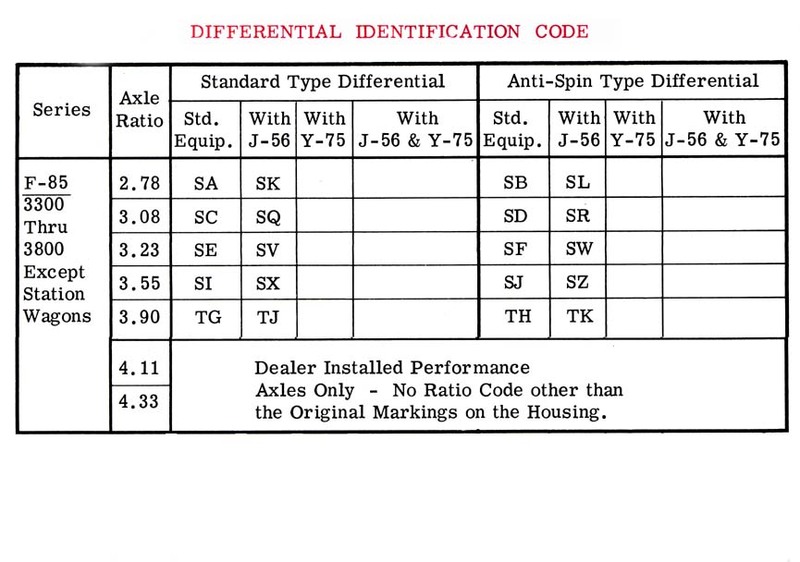 1968-72 rearend housings measure 58.5 inches from flange to flange, and with the brake drums in place, the total dimensions measure 62.5 inches. The dimensions are similar to the 1970-81 Camaro / Firebird, and 1975-79 X-cars and clones, except leaf springs were used. 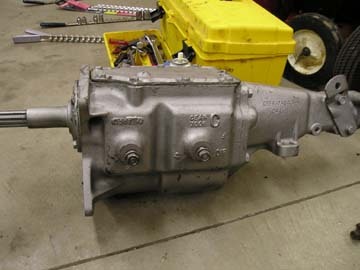 The Oldsmobile 12-bolt has a 12 bolt cover and a 10 bolt gear, which measures 8.3". Rear spring mounting pads differed, in which 1964-66 rearends used a flat pad with a hole drilled in the center. 1968-72 rearends have circular spring mounting pads, which are 3/4" higher than the early flat pad. 1967 was a transition year, in which A-cars might have a 1964-66 style rearend, a 1968-72 rearend (which is wider and commonly available), or a "hybrid" rearend, which will have the 58.5" width, but with the early spring mounting pad and trailing arm brackets. Rear upper control bushing eyes differ, and the positioning of the bushing eyes will differ. 1968-72 rearend housings will have a 3/8" forward positioning, which is farther than 1964-67 rearends. 1964 was the only year that the rearend bushing are small, and any upper trailing arm ( from any GM division ) will fit 1964 rearend housings. There has been a lot of conversation about the 2 speed shifter and how most of them are broken without a fix. Well I bought a running parts car about a year ago. It had a good shifter, console and several other nice options. Last November I tried to remove the shifter, I didn't realize that the dummy button on the right side of the handle had a set screw underneath the T handle which needed to removed first. Well I broke one of the ears holding the roller mechanism when I pulled up on the handle, the ear with the key. I was disappointed and added the shifter to the broken shifter collection. So last Saturday I met with my good friend Don who is very talented and does excellent fabrication work. I asked him to look at the shifter. He immediately said he didn't think it could be fixed. Then I told him that most of them were broken and no one really has a fix. He then said let me take it to the shop, I'm up for a challenge. A couple of hours later he called me and said, its fixed, usable and probably stronger than new, it won't break again. Especially now that I know how to disassemble and assemble it properly. I asked Don if he could share the repair information with other Olds owners, and it follows. Not sure if it would be the same fix for everyone but he also told me he could have made a new roller for it if needed. He used my original roller. First step was to mill a flat in the side of the shifter shaft on the same plane as the broken tab approximately .080” deep. 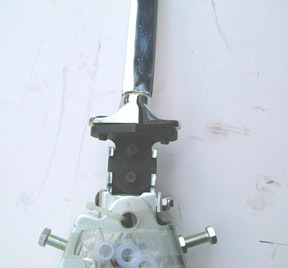 Next he machined a piece of stainless round stock with a matching taper to the shifter shaft. 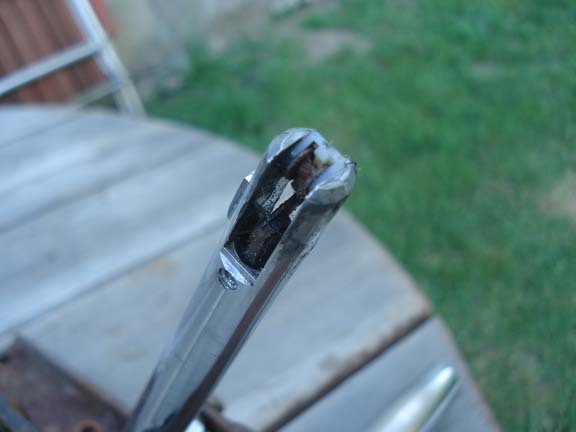 It’s outside diameter the same as the shifter from the tip of the broken end to slightly past where the milled flat ended. 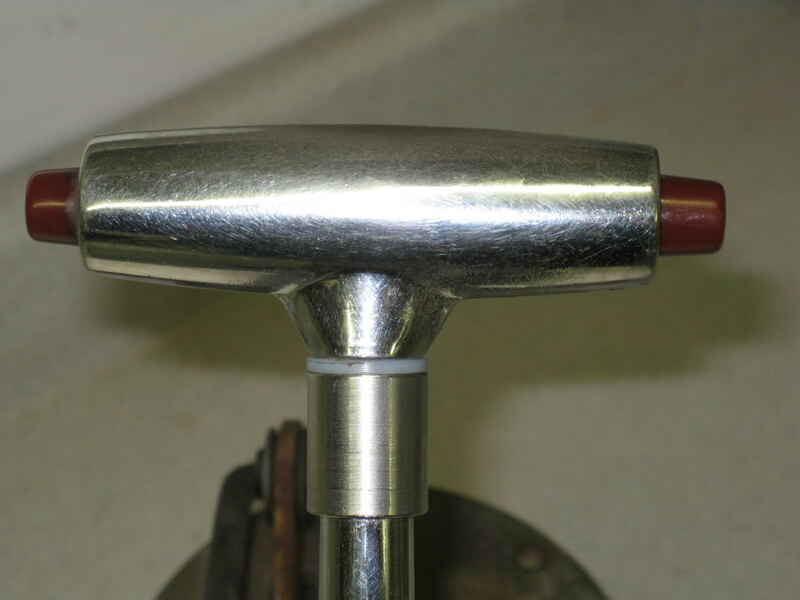 Then he milled off the thickness of the entire tapered portion to the thickness of the milled flat so the diameters would match when the milled piece was laid on top of the shifter shaft. Then he machined a stainless sleeve with a tapered bore in it that would slide over the shifter shaft and lock the milled insert in place. 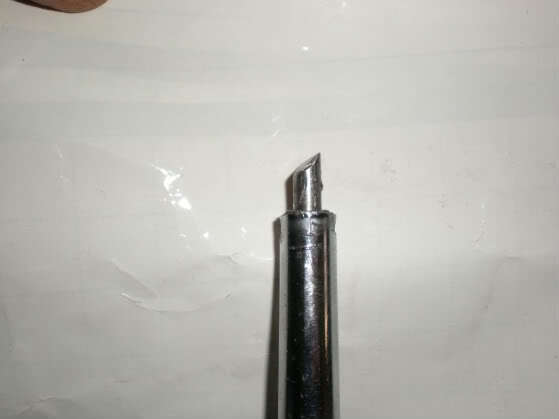 Next he machined a key-way slot .050” deep by .125” wide by .400” long in the side of the new insert to replace the key that was in the original broken piece. He also had to machine a key to fit. Then assembled the pieces and determined the distance between the bottom of the shifter handle and the top of the machined sleeve which was .070”. Removed the handle assembly and made a delrin washer .070” thick and slid it on the shifter shaft before reinstalling the handle. This creates a zero distance between the handle and the sleeve to prevent the tapered sleeve from loosening. 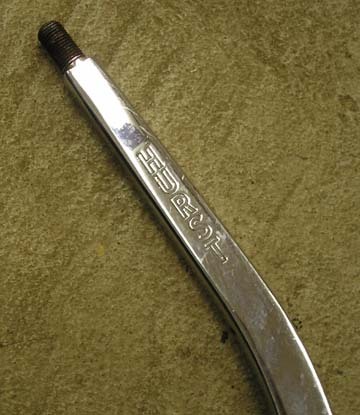 The repair uses a stainless collar (which could be chromed) underneath the handle, it looks like part of the shifter and probably is not noticeable in the car. Certainly most people would not know it was repaired. The repair makes the shifter functional and I get to use correct shifter for the car. Nothing was welded or glued in the process. Don said it took him several hours and wasn't easy. Bob Jones Long Island N.Y. 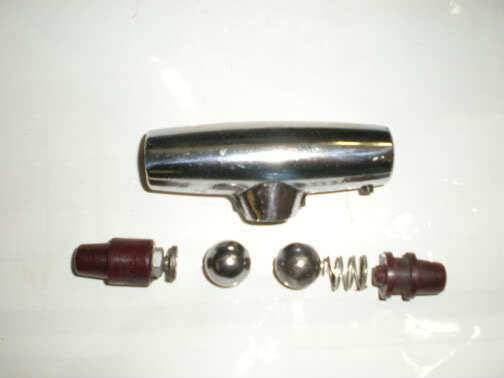 I have a great fix for broken ears on a 65,66,and 67 Cutlass and 442 Olds T-handle shifters. You must first cut both ears off, cut new ears on the lever with a mill, hacksaw,whatever, but be sure to duplicate the slot as close as possible. Then shorten the push rod same length as the ears were when cut off. 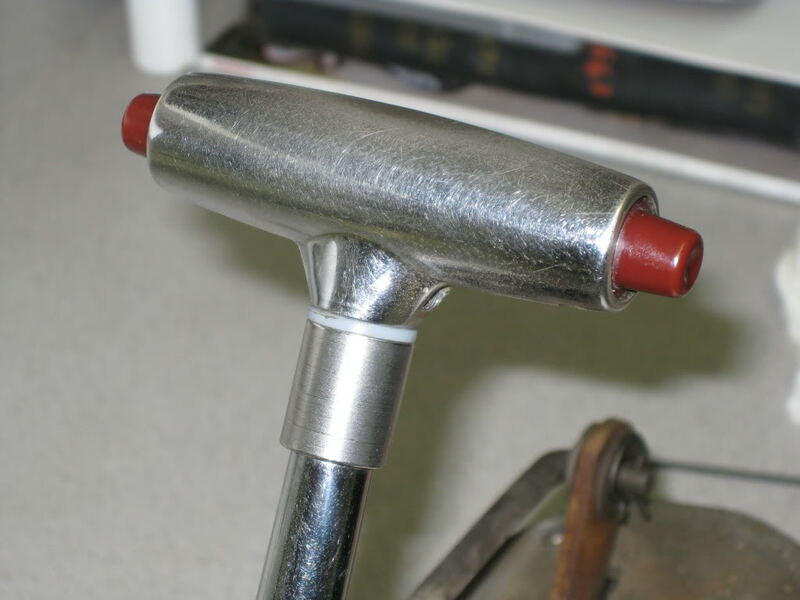 Now remove the little roller levers from the push rod by removing the rivet. Next reshape the push to the same shape as the original piece that you just cut off, drill a new hole in the push rod as the original and re-rivet the roller levers back, but not too tight. Now re-install the T-handle ---it will be a little tight, but it will go. My shifter works great and looks great. 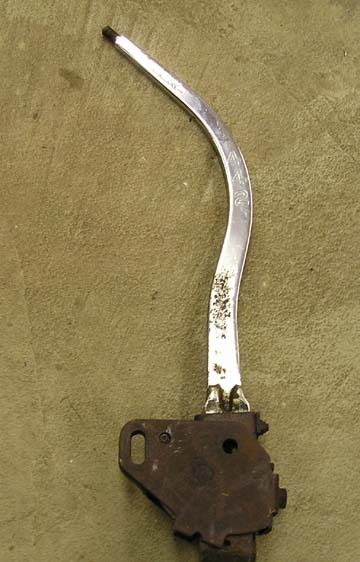 The only negative is that the shifter will be shorter by the length of the cut off ears, approx. 3/4 inch. I will try to send a picture. An "in coil" air bag is all you need, and you only need one, in the right (passenger side) spring. Air pressure in the bag is determined by rear ride height, tire size and pressure. Wheel hop can be caused by weak upper control arms, rear ride height incorrect (usually too high) causing pinion angle to be incorrect (using these no hop bars will almost certainly change pinion angle). Rather than using the no hop bars might as well use adjustable uppers, because all your doing with the no hop bars is changing the geometry where the uppers and lowers intersect. Your moving this imaginary line rearward, so you get a better instant center, this allows the rear axle to plant, rather than just squat .One other thing you might check is the condition of the body mounts, and bolts at the rear of the frame rails, forward of the rear wheels. Bad bushings, broken/loose bolt, especially passenger side will cause frame flex. 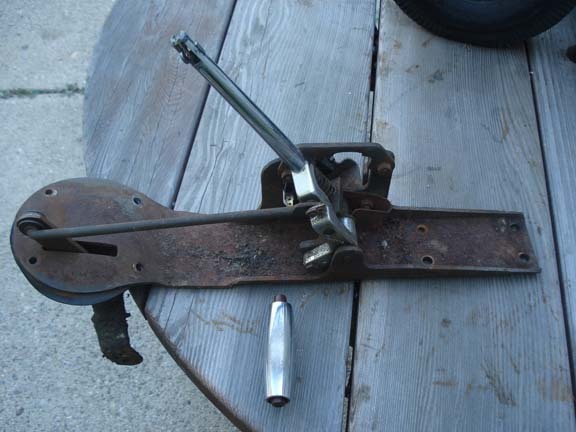 Also you could replace the pad on the frame directly above the axle, with a mount like the 64`s had, would really take the spring out of your frame. Now with all that said, get a bag, take a 1/2 hour, save your pinion angle, get rid of your hop. Please note that there are 7 different Muncie input shafts. All 26 spline inputs came with 32 spline output shafts and all 10 spline inputs came with 27 spline output shafts. A common mistake is thinking that all "fine spline" 26 spline input shafts are M22 heavy duty types. This is not true. 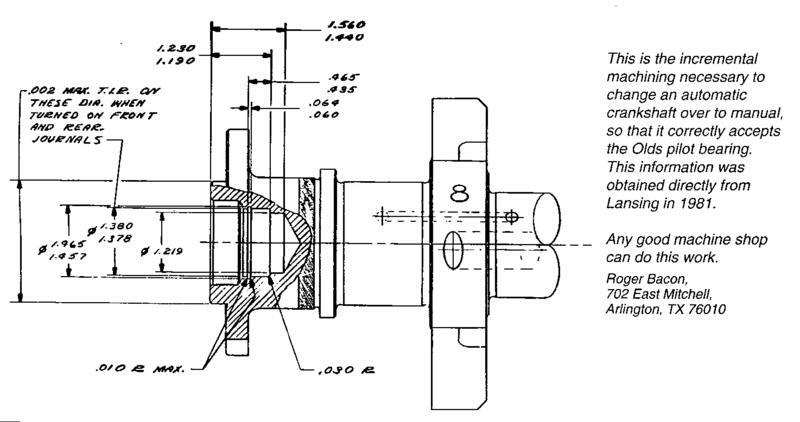 An M22 gearbox has a 20 degree helix angle on the gearset as opposed to a 30 degree angle. It's roughly a 10 degree difference. From time to time I get people disputing what exact angles are on the gears. Personally, I think the angles vary from gear to gear. 1st gear on an M22 may be 19 degrees, 3rd may be 20 degrees. Also M22 gear sets were of a higher nickel alloy. The straighter angle was designed to produce less end loading of the gear train and less heat but created more noise, thus the nickname "rockcrusher". The higher nickel alloy allowed for more impact of the gears. Another misconception is if you have a drain plug you have an M22. Again this was only true when the first M22 boxes were created. But all 3925661 castings had drain plugs. 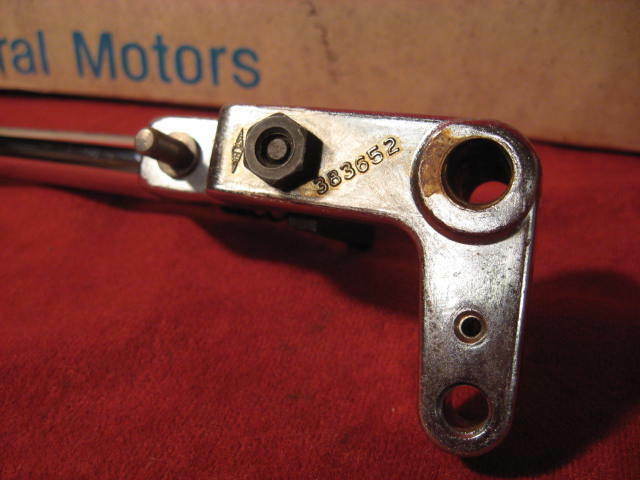 Serial numbers for Muncie 4 speeds always begin with the letter "P". P stands for Muncie Plant. Not for passenger car as some self proclaimed specialists may think. The letter M was used to ID the Muncie plant for the Muncie 3 speed, so P was the next logical letter. The letter O would add confusion since it resembles zero. 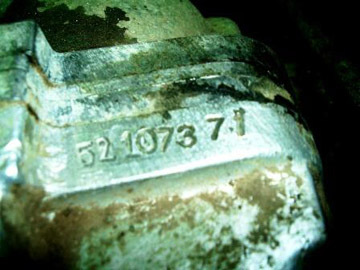 The serial number is a date code the transmission was built for a particular year. Serial numbers from 1963 to 1966 included only the month and day. P0101 would indicate January 1st. From 1967 to 1968 the serial number got a year designator and a letter designator for the month such as P8A01, meaning January 1st 1968. One important point is that if you have a Muncie dated with a December build date it was actually built the prior year. An example would be the date code P8T13. This is for a 1968 production car. The T stands for December and 13 is the day. To confirm this simply look at the VIN number. It will usually begin with a 18S101350 or a 28N12950. This means the Muncie was assembled December 13, 1967 for the 1968 model year. The VIN number will usually be a low number. 1969 to 1974 Muncies got a ratio designator at the end of the serial number. An example would be P4D23B. This equates to April 23, 1974, M21 ratio. 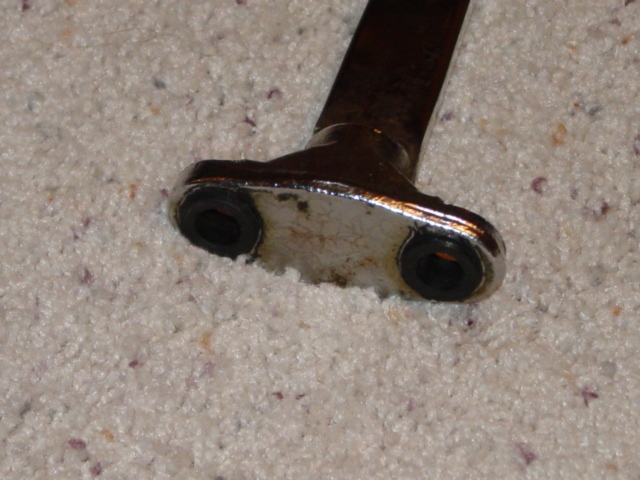 Some input shafts produced by the aftermarket and General Motors have no identifying rings on them. The rings originally corresponded with rings or grooves on the counter gear so that the assembler matched a one or two ring input with a one or two ring cluster. 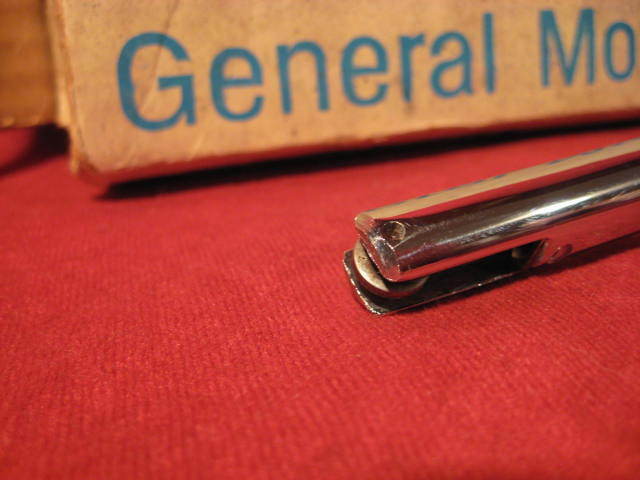 When manufacturing was stopped, GM stopped making inputs with these marks, probably to save machining operations. 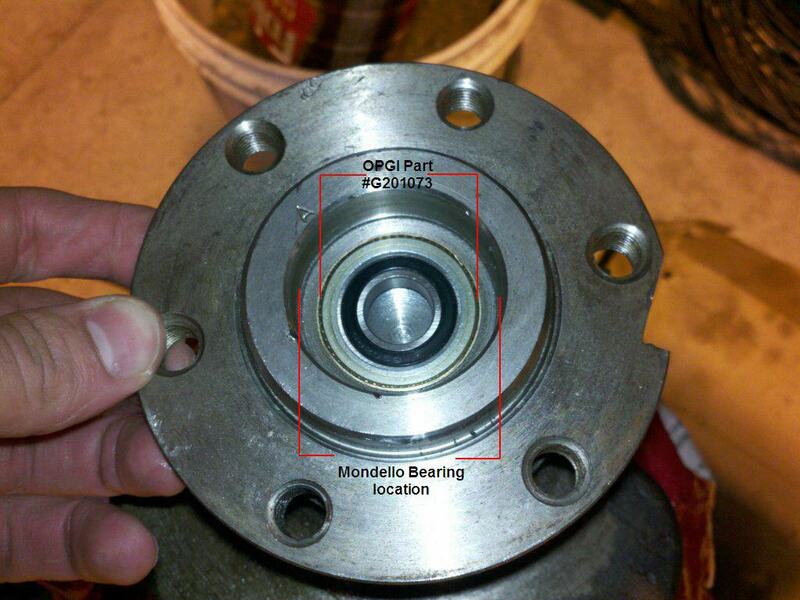 Also 3831704 and 3851325 castings come with a 7/8" counter shaft all others come with a 1 inch counter shaft. There are some odd ball castings out there produced in 1963 to 1966 years. I've left them out since they really are not common. Several things are needed to identify a Muncie correctly. The first is a main case casting number. Second a count of the input shaft and output shaft splines and if any rings or grooves exist around the input shaft splines. Third are date codes and VIN numbers that help confirm that the above case and gears belong together. Tooth counts on the input shaft will help confirm a certain gear ratio, but you may not have access to this information if the transmission is still in the car or an unwilling vendor at a swap meet won't remove the cover. Please note that there are 7 different Muncie input shafts. All 26 spline inputs came with 32 spline output shafts and all 10 spline inputs came with 27 spline output shafts. A common mistake is thinking that all "fine spline" 26 spline input shafts are M22 heavy duty types. This is not true. An M22 gearbox has a 20 degree helix angle on the gearset as opposed to a 45 degree angle. Also M22 gear sets were of a higher nickel alloy. The straighter angle was designed to produce less end loading of the gear train and less heat but created more noise, thus the nickname "rockcrusher". The higher nickel alloy allowed for more impact of the gears. Another misconception is if you have a drain plug you have an M22. Again this was only true when the first M22 boxes were created. But all 3925661 castings had drain plugs. 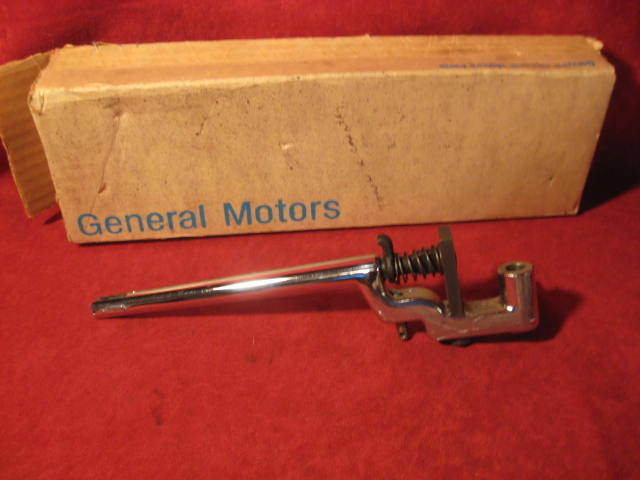 Serial numbers for Muncie 4 speeds always begin with the letter "P". P stands for Muncie. Why.... I have no idea. The serial number is a date code the transmission was built for a particular year. Serial numbers from 1963 to 1966 included only the month and day. P0101 would indicate January 1st. 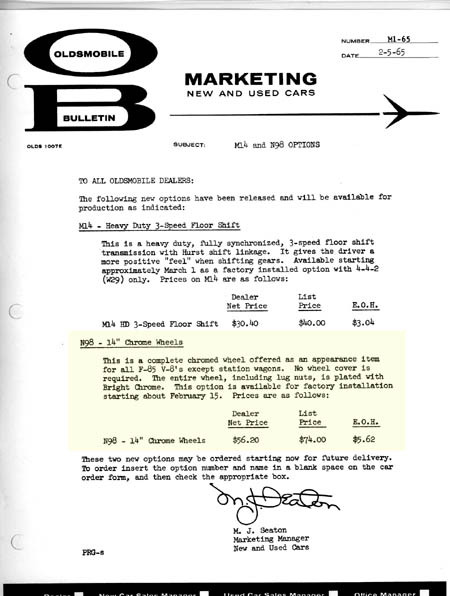 From 1967 to 1968 the serial number got a year designator and a letter designator for the month such as P8A01, meaning January 1st 1968. One important point is that if you have a Muncie dated with a December build date it was actually built the prior year. An example would be the date code P8T13. This is for a 1968 production car. The T stands for December and 13 is the day. To confirm this simply look at the VIN number. It will usually begin with a 18S101350 or a 28N12950. This means the Muncie was assembled December 13, 1967 for the 1968 model year. The VIN number will usually be a low number. 1969 to 1974 Muncies got a ratio designator at the end of the serial number. An example would be P4D23B. This equates to April 23, 1974, M21 ratio. 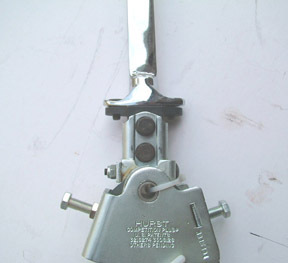 335308 Long boss bolt on type with neutral safety switch. Some have a boss for the switch that is cast but not machined on 1-2. You will have to put the rear up on jackstands, put the transmission in neutral. Make sure that the car is quite stable, get under the car, and TURN THE DRIVESHAFT. Count the number of turns of the driveshaft it takes to turn one wheel one time. If you turn a wheel, instead of turning the driveshaft, you will only turn the other wheel (not the driveshaft). It also works better (more accurate) if you turn the driveshaft enough times to turn one wheel ten times, and count the number of times you turn the driveshaft. This is because it may be difficult to tell if the driveshaft goes around, say, 2.56 or 2.78 times for one turn of a tire. But if you turn the driveshaft enough times to turn a wheel ten times, you will have 25.6, or 27.8, or 41.1 (or whatever) turns of the driveshaft. Then just divide by ten to get the ratio of the rear. Note also that there are two different ring gear carriers, one for 3-series ratio gears and one for 4-series gears. The difference is the dimension from the ring gear mounting flange to the pinion centerline, due to the larger diameter pinion required for the lower numerical gear ratios. A set of 4-series gears can be installed in the 3-series carrier with a spacer and longer bolts (not desireable due to reduced strength), but the reverse is not true.